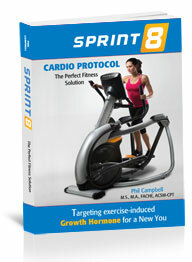 An award-winning home fitness equipment company - now features Phil Campbell's cardio "Sprint 8" program on their fitness bikes, elliptical trainers & treadmills. NOTE: Research shows that the fastest 10K runners were also the fastest over 40 meters. This book shows you how to increase and strengthen your fast-twitch muscle fiber. "blast fat fast, even on the busiest day." "Campbell's book will become the next health & fitness bestseller"
"You will NOT be able to put this book down." Sprint 8 Cardio Protocol shows readers sprint-intensity cardio targeting exercise-induced growth hormone to create a NEW YOU with more energy. A new you with improved cardiovascular fitness. A new you with less body fat, more muscle and stronger bones. A new you with enhanced optimism. And a New You with better health. "The information in it is unbelievably good...one of the best fitness books I've read...a classic. I'm very happy that I found it. It's a great resource. This is an excellent fitness book. It is both well researched and well written. What makes this book so good is the fact that if you follow the program the author is outlining, then you will cover every aspect of fitness that is important, the author does not leave anything out. From weightlifting, to cardio, to stretching, to anaerobic interval style training, everything is present in this program. I have read many other books that make an argument that weightlifting is essential, but leave out how to integrate cardio work. Some books emphasize cardio, but leave out the short "sprint" style interval training that is so important to overall fitness. This plan covers everything! "Best fitness book I've ever read. This book is filled with detail and explanations that will be interesting and helpful to all levels of people. Whether you're looking to get in shape, loose weight, take your fitness routine to the next level, gain more strength, endurance or speed this book covers it all. The many illustrations make it easy to understand what the text is referring to. I really like the "total" approach suggested by this book. It addresses stretching, diet, strength training, speed and agility and much more. Phil Campbells blockbuster new book, Ready, Set, Go! Synergy Fitness takes an effective stab at the prevailing wisdom in the fitness world. Ready, Set, Go! Synergy Fitness is a radical new approach to shaping the ultimate physique. It contains the program for drastically changing your body for the better. Experience motivational presentations and group training sessions by Phil Campbell during Greta Blackburn's Fit Camps.